The November 9, 1972 launch of Telesat Canada’s Anik A1 satellite from Cape Kennedy, Florida was to have a profound effect on communications in the Northwest Territories. Anik (Inuktitut for ‘brother’) was the world’s first commercial, non-military communications satellite placed in a geostationary orbit. This type of orbit, 35,000 kilometres above the surface of the earth, meant the satellite remained stationary over a single point on the earth and a satellite dish pointed in the right direction would receive television and telephone signals. For many northern communities Anik A1 brought them their first live television broadcasts. Before Anik the handful of northern communities with television broadcast facilities had to rely on taped programs mailed from southern broadcast centres. Week-old hockey games and news programs long out-of-date were the norm in the north. The arrival of Anik not only brought current up-to-date programming but long distance telephone services became reliable, much less dependent on atmospheric conditions for a clear signal. 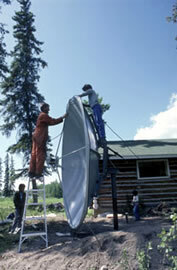 Community-based satellite dishes were set up in remote northern towns and villages and television signals were then re-broadcast locally. Anik A1 also meant that television programs produced in the north could now also be sent south and 1978 saw the opening of the Northwest Territories’ first television production facilities in Yellowknife (map).